2 short films made as companion works, both initially shown at a solo show at the Studio Pavilion, House For An Art Lover, Glasgow, May-July 2018. "The Hide": a film that records the passing of time in a wildlife hide on the west coast of Scotland. The hide allows the viewer to look upon the landscape through a long, panoramic viewing aperture. It looks out onto the land and water in a location where time is governed by the inexorable regularity of the tide. It’s mid-summer. The wind rifles through leaves, insects hover, and the camera examines the space viewed from the hide, but also of the hide itself. It’s a place that is almost a pause in the landscape, a place to view a pause in the landscape. Nothing happens. We just watch and wait. The film is shot on Super 16mm digital format. Dur. 9'18", Looped. 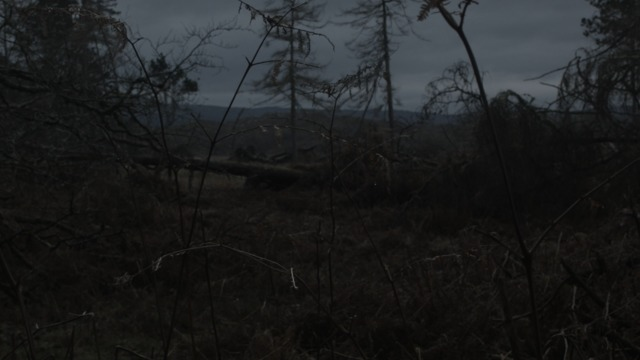 "A Darkening": like the hide, this is a film that slowly examines and explores a landscape. This is a landscape at a point of transition - the transition between day and night, and between one year and the next. It was filmed at the transition between 2015 an 2016 on the land around Dorlin/Castle Tioram in periods of calm and stillness at dusk around otherwise stormy, wet weather. The images of the landscape are dark, damp, and held deep in the grip of winter. The film is also shot on Super 16mm digital format. Dur. 4'33", Looped.